Here we are back again at another Fab Friday challenge! Time really does fly when you're having fun....that or you're just so busy there isn't really even a moment to look at a clock to check on the time passing! One thing I do know is that the last 8 years as a Stampin' Up! Demonstrator have just flown by. I celebrated my 8th anniversary yesterday and continue to enjoy creating and teaching others about papercrafting. I'm blessed that my family supports me and that I continue to have such a lovely group of stampers join me every month for classes. Here's to another fun 8 years! Check out this cool sketch for challenge number 105! What are you going to do with that circle?? I was so happy when the new Stitched Shapes framelits were available again after flying off the shelves back in the fall. I wasn't quick enough with my order so I missed them the first time. They finally arrived last week and I was happy to see that I could use them right away on my Fab Friday Challenge card! The base is Crumb Cake - which you can't see at all because it's covered by the gorgeous Serene Scenery DSP. This is a pack with a fun mix of real photo images and printed patterns. The other day I needed a "thinking of you" type of card and when I went to my card box to get one there weren't many choices so I figured I had better get a few made to keep on hand. I cut the circle with the Stitched Shapes framelits and then nipped the edge off. I embossed in black "is on its way" from the Sunshine Sayings stamp set. Above that is the big die cut "sunshine" from the coordinating Sunshine Wishes Thinlets. I did a watercolor wash with Daffodil Delight ink on Shimmery White cardstock to keep the feel light and bright...I didn't want to use the Daffodil Delight cardstock as it was a bit too "in your face" yellow for what I was going for. Behind the circle I layered some ribbon scraps and used a cute little safety pin tied with a baker's twine bow. 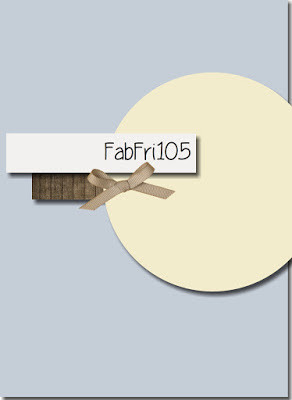 To balance the ribbon and clothespin elements I added a few enamel shapes to the top of the circle. I hope you'll join the Fab Friday team with this fun sketch challenge! Link up in the gallery so we can see your creative genius!